To mark our 15th birthday in 2015, we created this events creative blog. We hope that it will develop into a useful resource and give an informative insight into our role within the creative industry and the 300+ events we produce for our clients each year. The Production 78 Office will be closed from Friday 18th December 2015 at 5pm until Monday 4th January 2016 at 9am. We would like to wish all of our customers, suppliers and staff a very Merry Christmas and an eventful New Year 2016. 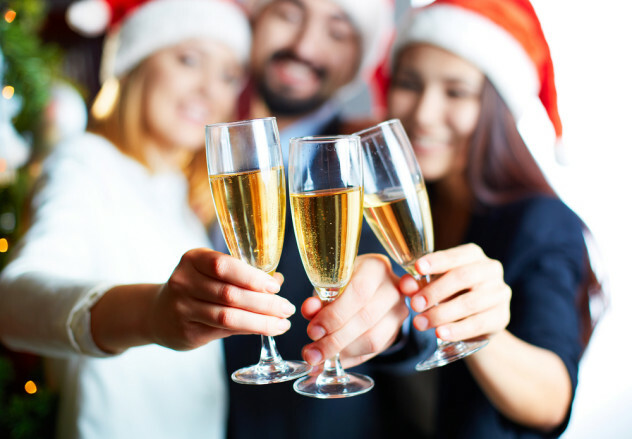 At Christmas everything is in high demand, including venues in which to hold your Christmas Party. If you leave it too late you could end up taking people to a greasy spoon with a 1 out of 5 food hygiene rating and nobody wants that! Diaries get booked up quickly around Christmas and if you want a full table with no empty seats then it’s in your favour to get organised and send out those invites. If you run a company that solely employs full-time staff, then your guest list requirements may be quite simple; all of your employees and their plus ones. However, if like us you employ a high-number of freelance staff then your guest list may well be slightly more complicated! One way to simplify things is to perhaps only invite freelance staff that have worked for you in the past year or six months (dependant on the size of the company and the capacity of the venue you have booked). If everyone brings a plus one you instantly reduce the level of work based conversation that needs to take place! As well as providing an opportunity for your colleges to finally meet your other half (the source of all your morning rants about the state of the house or the reason that you had to do the school run that made you late into the office), plus ones bring different conversation topics to the table and prevent us turning what is meant to be a celebration into another meeting, albeit in a slightly less formal environment. Here’s your chance to strategically avoid any mulled-wine-fuelled heated discussions. Whilst avoiding placing the not so harmonious co-workers together, you can also use this opportunity to get staff from different areas of your business chatting. Stronger relationships between all areas of your business can only be a good thing. If possible, a good idea is to get your menu choices to your venue in advance of the event. This takes the pressure of both sides. The catering staff will be able to prepare your meals in a methodical way with plenty of notice meaning that your food arrives on time with no hiccups. And you and your staff get to enjoy the festivities without the pressure of deciding what to order! Another idea to take off some of the stress for your staff is to organise transport to and from the venue. Depending on number of staff attending and the location of your venue you could organise pre-paid taxis, or even book a couple of coaches. With it being December, arranging for there to be a cloakroom at the venue can only work in your favour. If you are having a sit-down meal and everyone has their big winter coats on the back of their chairs it can feel quite cosy at the table, it can also provide some obstacles for the poor waiting staff serving you all! Storing coats in a cloakroom is just another way to show how much time you’ve spent thinking about putting your staff first at their Christmas Party. Now this one can divide opinion, whether to have a dress code and matching décor should be a decision made after a fair amount of thought. 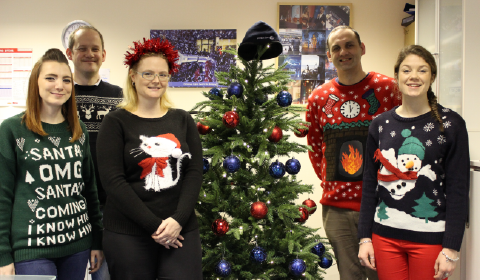 Some workforces might be 100% on board with Christmas Jumpers and in your face cheesy Christmas Dec’s, however, some may prefer a subtler smart-casual dress code with just a few crackers to pull and optional paper party hats! This will be dependent on all the decisions you have made so far. Will some musical accompaniment be suitable for your party? If so, will an iPod with some Christmas tunes do? Or do you want to go the extra mile and book a band to perform? If you are booking entertainment for your party, this is something that needs to be done early too. If you want a high-quality act chances are they will get booked up quickly so contact them well in advance to avoid having to book Gary from IT’s band. 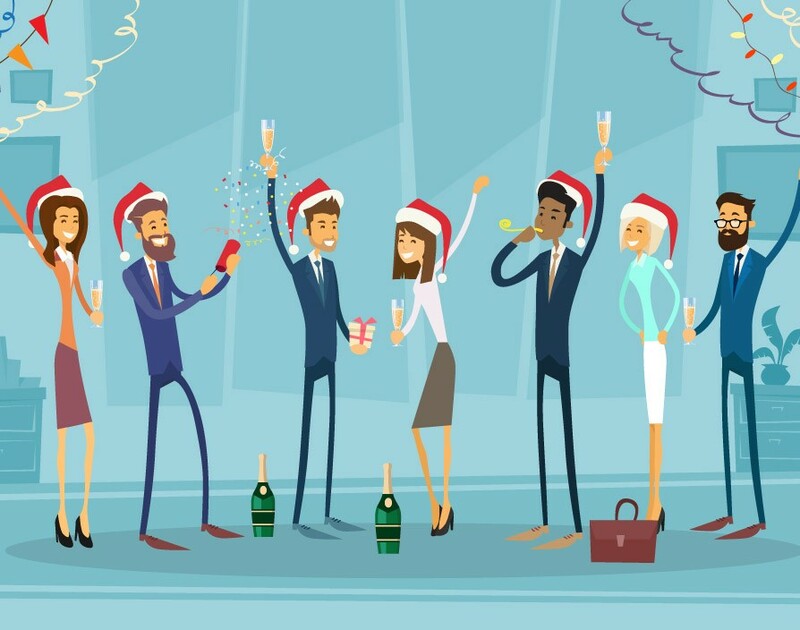 Although alcohol can result in some pretty embarrassing moments that your staff will be trying to live down for the next year, nothing says ‘Best Boss Award’ like an open bar. We’re not encouraging you to blow a large percentage of your year’s profit on the bar (after all, you must drink responsibly) but enough money to buy every member of staff a few drinks would go down very nicely I’m sure. Nowadays, people love an excuse for a selfie. You could go old school and place disposable cameras on tables, or even book a professional photographer to capture the evening. After all, it took a lot of work to get here! 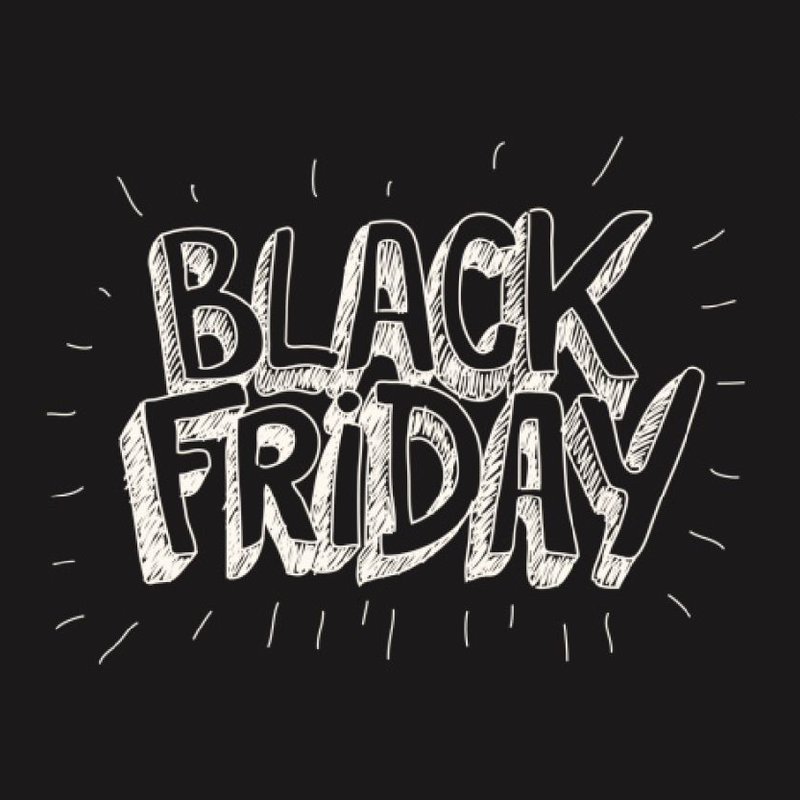 Here at Production 78 HQ we have decided to jump on the bandwagon and offer a Black Friday discount on any Lectern Hires booked in the next week. It doesn’t matter when you plan to hold your event, so long as you have contacted us before 5pm on Friday 4th December we will offer you a 10% discount off the price of a lectern. 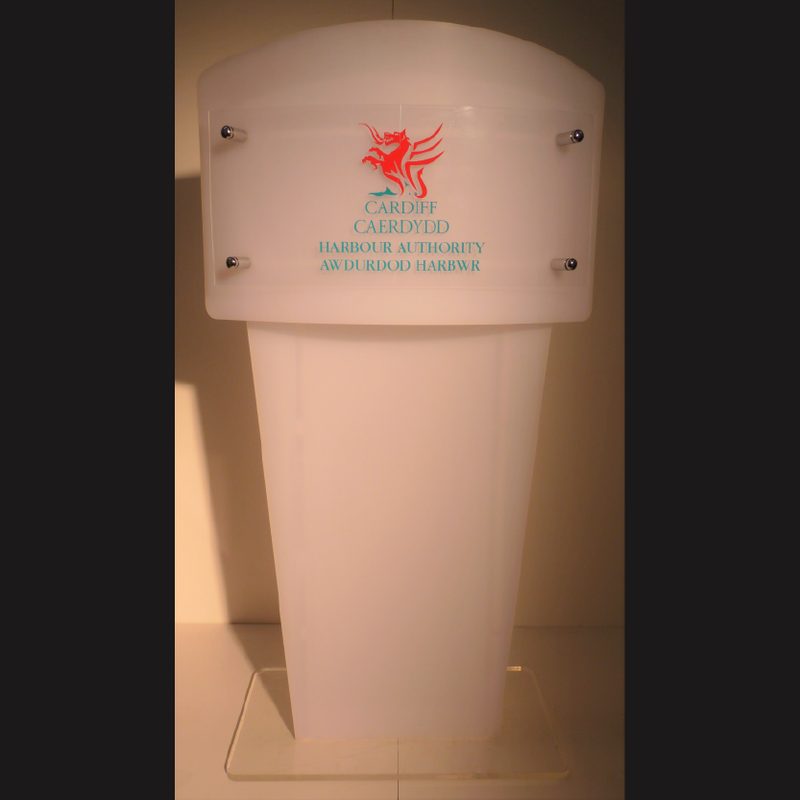 We can also offer custom printed Perspex front panels for our ‘Curve’ lecterns which have proved very popular with previous clients such as Hilton Garden Inn, Lloyds Bank, and the Welsh Government. Whether you’re planning a product launch, awards ceremony, or conference, we will have the right lectern for you. 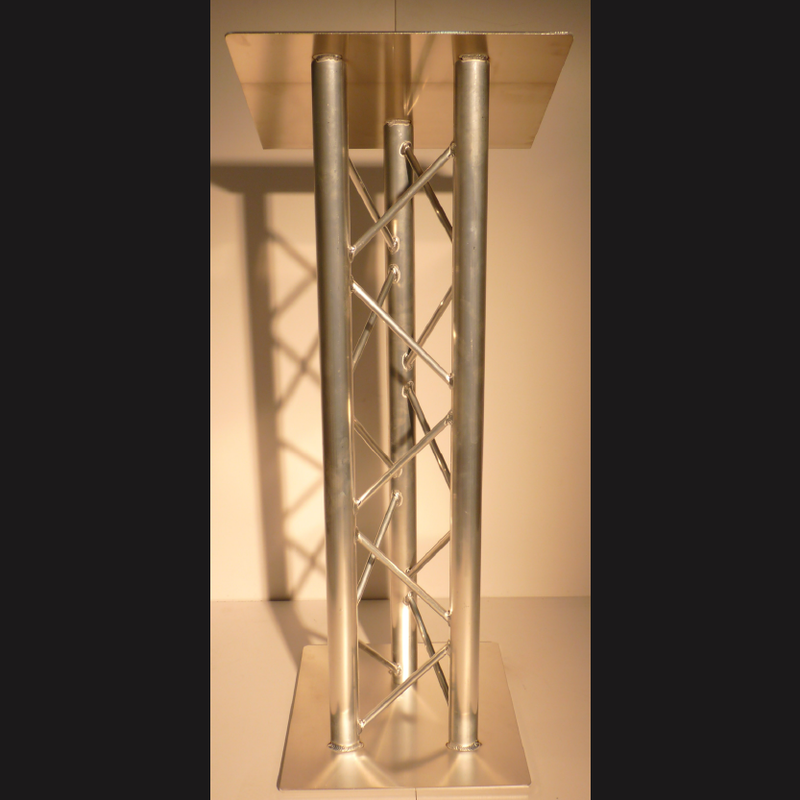 Simple tri-lite aluminum lectern, our most basic and cheapest model. 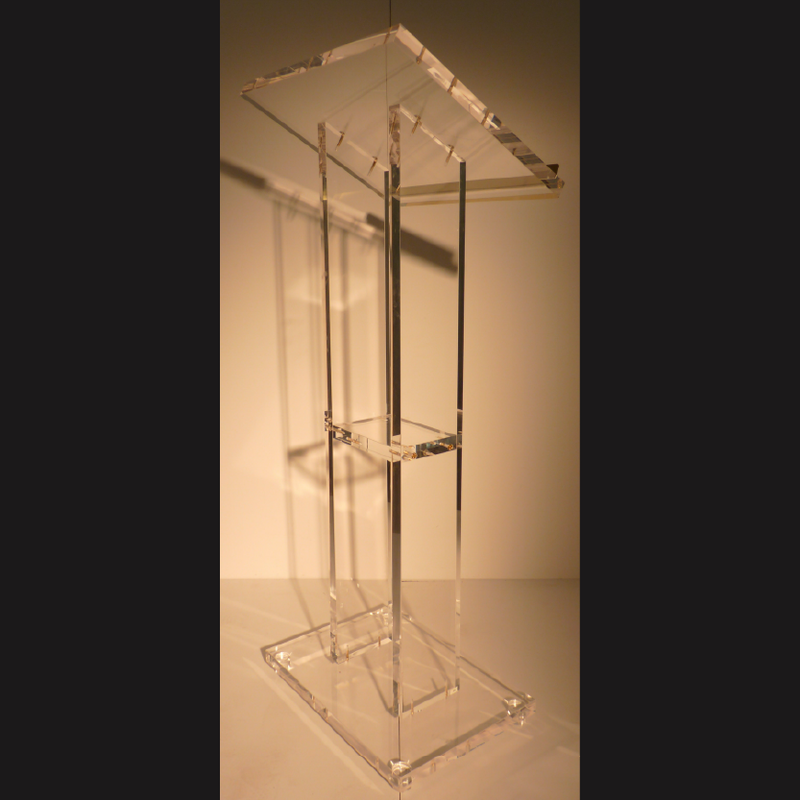 Clear Acrylic lectern with a sturdy lower edge to support a laptop if required. Frosted Perspex curved lectern with option for custom print front panel. *Payment of a 50% deposit must be received by December 11th to secure discount. Offer subject to availability. 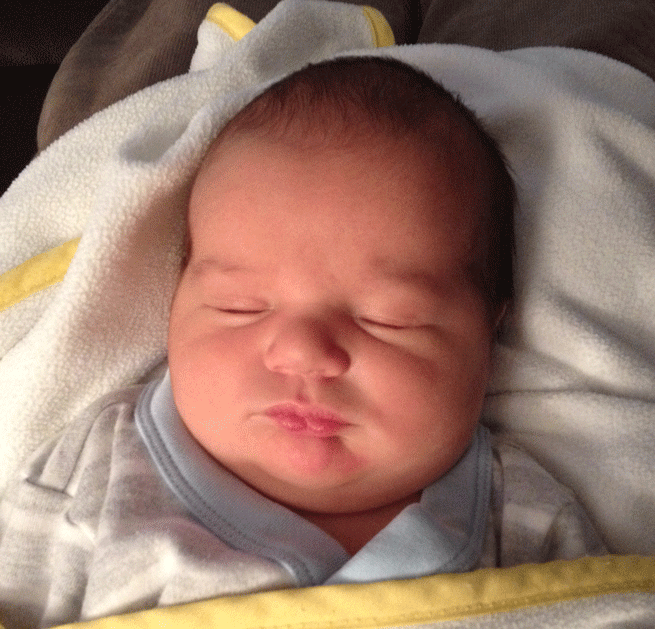 Join us in welcoming the newest member to the team, little Ben! All of us at Production 78 are incredibly happy to congratulate our Director of Sales Stephen and his wife Sally on the birth of their beautiful baby boy. Here’s to many lunchtime office visits and cuddles. When should you get in contact with an events management company? When first thinking of planning an event, no matter how big or small your ideas may be, it is important to consider when is best to get another’s opinion. You might not think you have enough material to approach an event management company yet, or you may even think that your event wouldn’t be something that would benefit from external input. But how can you be sure if you don’t ask? We all know Rome wasn’t built in a day, so if you want your event to be of high quality, whilst being cost effective and stress free then drop us a line now and not next month! Even though we invest an equal amount of attention and care into every single event we work on, there will be times when we are busier than others. It’s beneficial to set up a meeting with us as soon as is appropriate so that we have longer period of time over which we can develop ideas with you, whilst still delivering other events for other clients. From our point of view, we can often be left wishing we had been brought on board earlier so that we had had enough time to realise some of the bigger and more exciting ideas we have for your event. Conversely, sometimes that initial meeting helps us to decide that actually, our involvement won’t be necessary until the day of the event itself, but this is still incredibly useful to know from the outset. It means that our involvement on that day will be sure to fulfil the high standards like we like to uphold instead of a last minute job that we try our best to pull together on a weeks’ notice. Having someone else to bounce ideas off is integral to keeping your headspace clear. Going over the same problems time and time again by yourself could be causing you stress, as well as wasting time, when someone else could end up providing you with a solution in an instant. Even when you actually work in the events industry there will always be new puzzles to solve and we often ask each other for input in the office (even if it’s just to find out where we left our glasses). 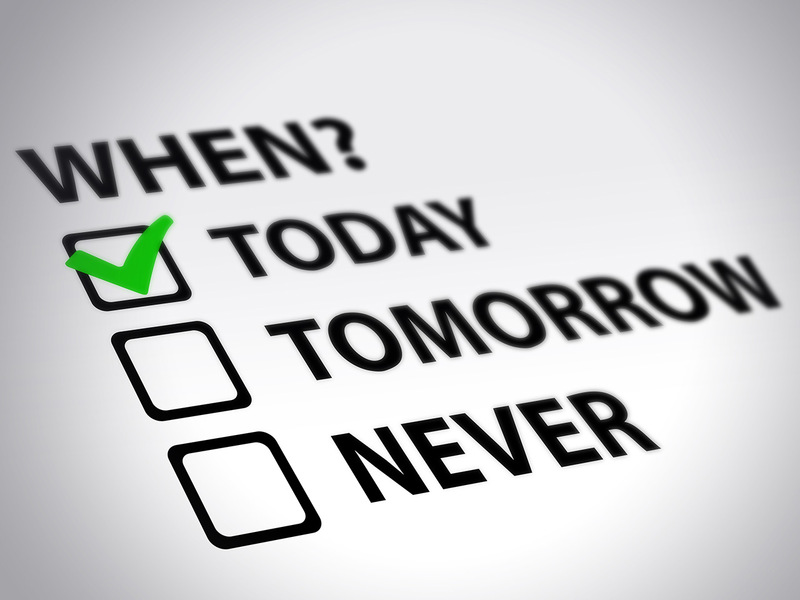 Contacting an event management company as early as possible will always be beneficial. So be a cut above the rest and spend the time that you have wisely, trust me, your event will be better for it! Today marks the 15th Birthday of Production 78 Ltd. and to celebrate we’re launching our new blog! Fifteen years ago today Company Directors Duncan Thompson and Stephen Burkitt-Harrington signed the paperwork making Production 78 Ltd. official. Here’s a picture of them from back in the day to refresh your memories of a time when they had more hair and less wrinkles! Every year brings new challenges and opportunities for growth and the company has progressed massively from its starting point in an office with two solitary desks on Churchill Way. In 2005 we moved to an office with several storage units in Big Yellow on Penarth Road. And after out-growing that in 2013 we moved to our current base, a bigger and better unit in the Southpoint Industrial Estate in Cardiff. But with overflowing shelves and very little visible floor space (and this is not a reflection of our tidiness, we just have that much stuff!) we’re already considering moving on to yet another a larger space. After all, we now have two new members of the team to accommodate and there are no signs of slowing down! Congratulations and welcome to Rob Hall our new Production Technician and Abi Allen our new Sales and Events Development Assistant. With Christmas around the corner the team are currently busy with all things festive, including Christmas Light Switch ons and other seasonal celebrations. But what’s really top of the list is where we’re going to have our Christmas meal this year! Any suggestions? Back to business - we’re planning on posting weekly updates on what we’re busy with. So keep your eyes peeled for more interesting blogs about the events we’re working on, industry news, and new products and services that we can offer. Thanks for stopping by, now go and get yourself some cake to celebrate!